Meta tags are keywords used to locate your website by a search engine. 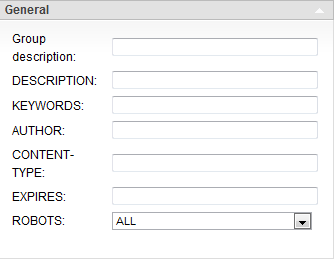 You can create new meta tags and meta tag groups, which can be assigned to different pages. This should be done only by users with HTML-knowledge. To add or edit meta tags, go to New -> Meta tags OR Admin -> Meta tags and click the New button in the New section on the left side of the page. The MetaTagDetail page is loaded. The page contains the Tools section on the left, and General and Properties sections on the right side. 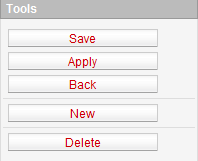 Please note that some functions/buttons are displayed only after saving. Saves the meta tag. The MetaTagsOverview page is loaded. Saves the meta tag and you remain on the MetaTagsDetail page. Takes you back to the MetaTagsOverview page. No changes will be saved. Loads a new MetaTagsDetail page for creating a new meta tag. Deletes the current meta tag. You can assign a category to the meta tag group here. You can edit the tasks for the current meta tags with this function.